An investigation is a cost effective way to find out if a property has the potential to be subdivided. 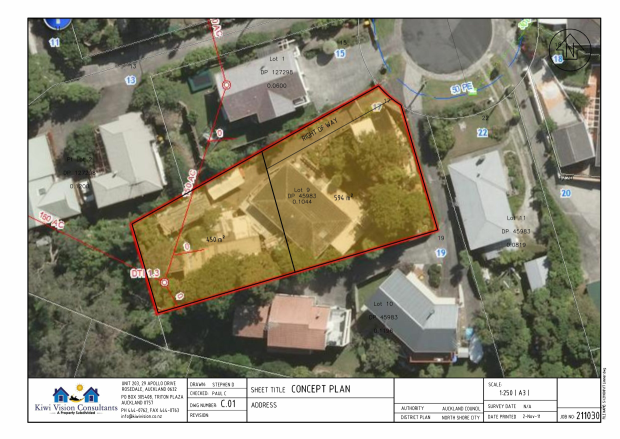 At Kiwi Vision we will do as much (or as little) as you require to determine if a property has the area to be subdivided and outline any possible difficulties that may arise along the way. These are some the factors that we look at when determining the viability of subdividing a property. As part of this service we provide a report and will often prepare a plan (like the example below) showing some possible boundaries.